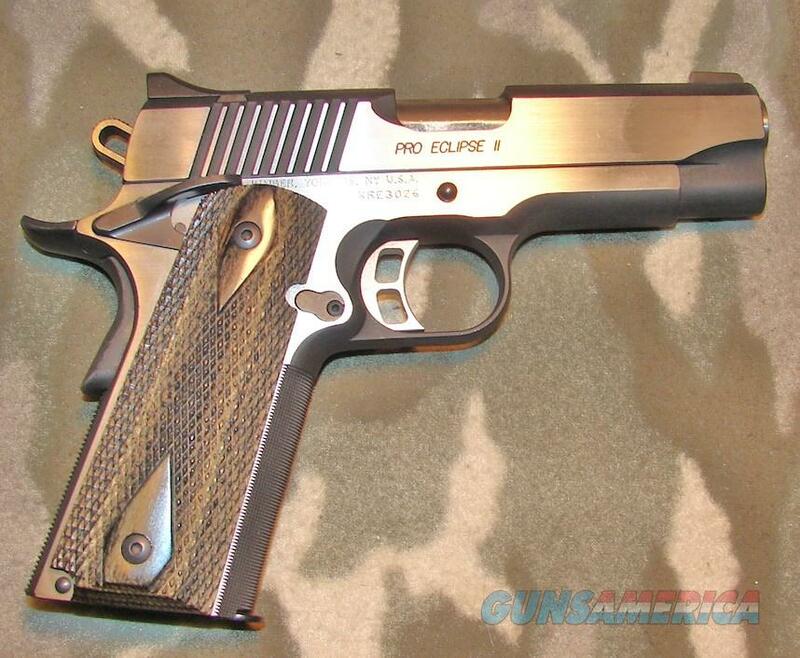 Description: Kimber Custom Shop Pro Eclipse II semi-auto pistol serial #KRE3026, 45 ACP, 4" barrel with an excellent bore. The stainless steel surfaces are in near excellent condition with a few minor scratches on the slide and frame; and one prominent scratch below the slide stop. The checkered double diamond grips are in excellent condition. The checkering on the front of the grip frame and flat mainspring housing remains crisp. This stainless steel framed pistol features ambidextrous safeties, match trigger; and drift adjustable, three dot, night sights that are still visible. A blue steel, factory, seven round magazine is included with this pistol. These pistols have a distinct appearance with the blackened stainless steel surfaces contrasting nicely with the polished stainless steel flats on the slide and frame. There is no box or papers.